The Lenox Village Church Figurine has golden light spilling from welcoming windows, and holly garland trim heralding the holidays. This inviting beautiful Church is impossible to resist. 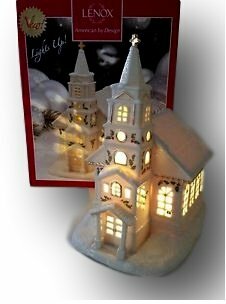 Crafted of fine, hand-decorated porcelain Long-lasting LED lighting Requires 2 AAA batteries Width: 6 1/3" Height: 7 3/4"